St Patrick’s day is not only a good day to dress in green and eat corned beef. 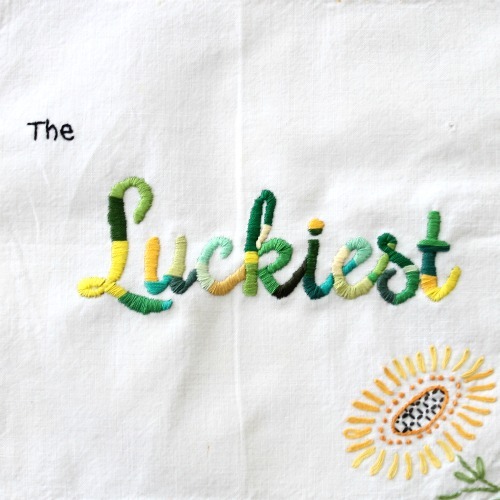 It is also a great time to remember just how lucky you are. And let me tell you, I feel pretty darn lucky these days. My toddler is spunky and fun. He is started to talk and I can’t wait for that. My three month old baby is just the sweetest, sweetest baby EVER. I get to be home with them and I just feel so lucky! To that is why I stitched up this little hanky this week. I really do feel like the luckiest girl around. First of all, open a word document and type out your words. Pick your font and play with size. Then, tape you fabric to the screen and trace the letters onto the fabric. As you can see, it doesn’t have to be perfect! Then, grab your embroidery hoop and start stitching! The stitches are simply straight stitches where your needle comes up on one side of the outline and goes down on the other side. Just make sure to cover up the marker! I used three threads at once and stitched so that the entire outline was filled. I chose to use yellow and green for this project, for obvious reasons. 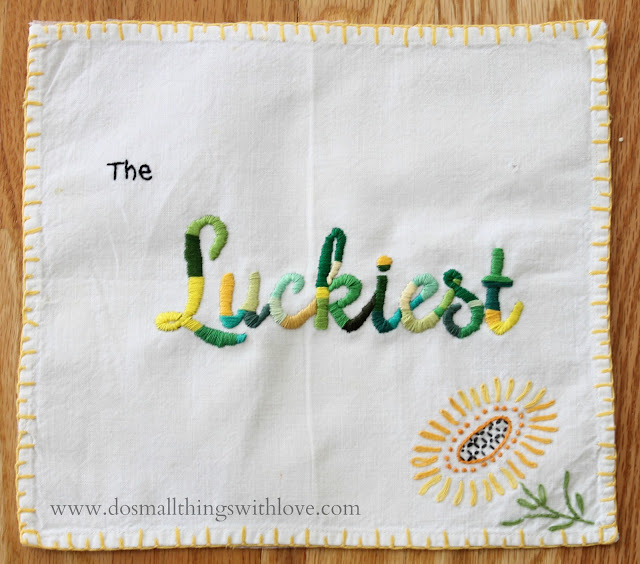 It helped that I am a bit of a hoarder when it comes to embroidery thread…I still have thread from 4-H projects I did in elementary school….and I used some of that old thread in this project! The little “the” up in the corner is just backstitching. Ta Da! I currently have this pinned up in my craft room. A good reminder of my blessings on those days I am throwing myself a little pity party. Finally, here is a picture of my little family last year on St. Patrick’s day. I had just found out I was pregnant a few days before this…and now we have our little girl. We really are the LUCKIEST. And, just for fun, here is “The Luckiest” by Ben Folds. Love this song! This is so simple and beautiful. I didn’t think of tracing from my computer. I’ve printed a paper and gone through all the trouble of taping it to the window then taping my fabric over the paper, then standing there and tracing using the sunlight. Computer screen is much simpler!!!! Also, I thought this was a machine stitched piece at first glance and was disappointed. So HAPPY and impressed that you hand stitched it!!! Looks machine! you are so sweet! My stitching has never been mistaken for machine before. I’m thrilled! Pretty! I love the colors in Luckiest! Thanks for sharing @ Submarine Sunday! What a gorgeous job you did, Nancy! I was going to say the same thing! I thought of the Ben Folds song! Your hankie is super adorable!!! Thanks Sabrina. I heart Ben Folds! The first thing that I thought of when I saw that first image that said “the luckiest, I thought of the Ben Folds song- which my cousin sang in my wedding ceremony. Very cute hankies too! I al most cry when I hear that song! What a perfect song for a wedding.